I can’t believe what They did to MY back yard. I’m going to take a break from the health thing (I go to the vet tomorrow) to show Their stupidity. It is soooooo bad, I can’t even bear to look at it. Phoenicopteris Ruber is the scientific name for the Flamingo of the Carribean. Phoenicopteris Ruber Plasticus should be self explanatory. Somebody gave Them 2 Phoenicopteris Ruber Plasticii and They actually put them up because They didn’t want to offend the giver. These things belong in Florida, not Arizona. It’s as silly as putting wooden saguaros up in Miami. I think the worst health issues are the ones affecting Their thinking. If They moved to the UK, They’d probably put up Kangaroos. I love flamingos. I have lots of them. Not pink plastic ones, but lots of other kinds from lights for our boat to big tall medal ones that sit in my living room. I’m pretty certain that the purpose of these is to annoy me. You mean us Brits shouldn’t put up kangaroos?! Oh hoomans! Weird neighbo(u)rs are not the same as your very own weird peeps. Pink flamingos are a mainstay here. When people have babies, their yards are littered with either blue of pink flamingos. You have to forgive their weird behavior. 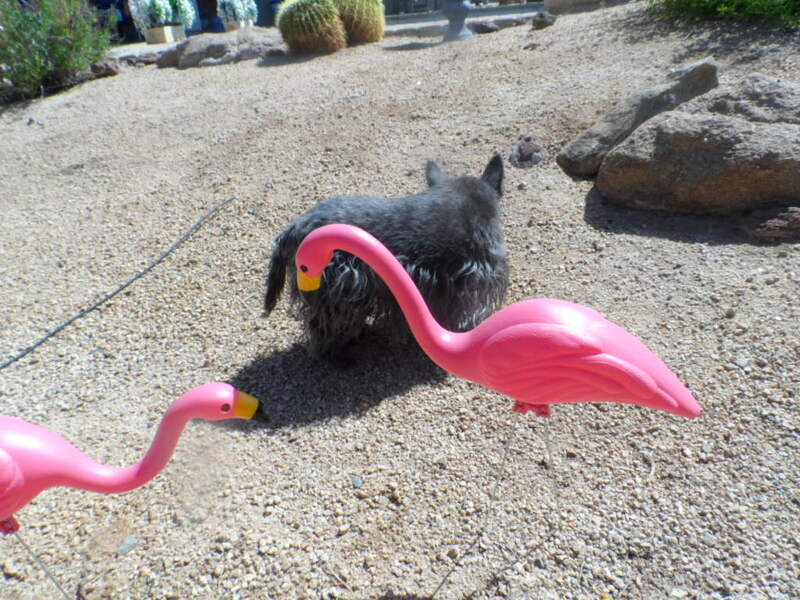 Oh Kyla, I have to lives with all sizes and colors of these Flamingos here! Thou, Ma hasn’t yet gotten the pink plastic ones yet…yet. I fear not-they survive Florida so the should survive here also. I’m worrying about reproduction, I hope they’re the same gender. I’ll have to ask Kismet. I asked Kismet and she said that she didn’t know anything about plastic birds. I love flamingos! Do you think if your flamingo’s eat your cactus tree they will turn green? Good luck tomorrow paws crossed. No, but when they drink water, they’d sprinkle like crazy. 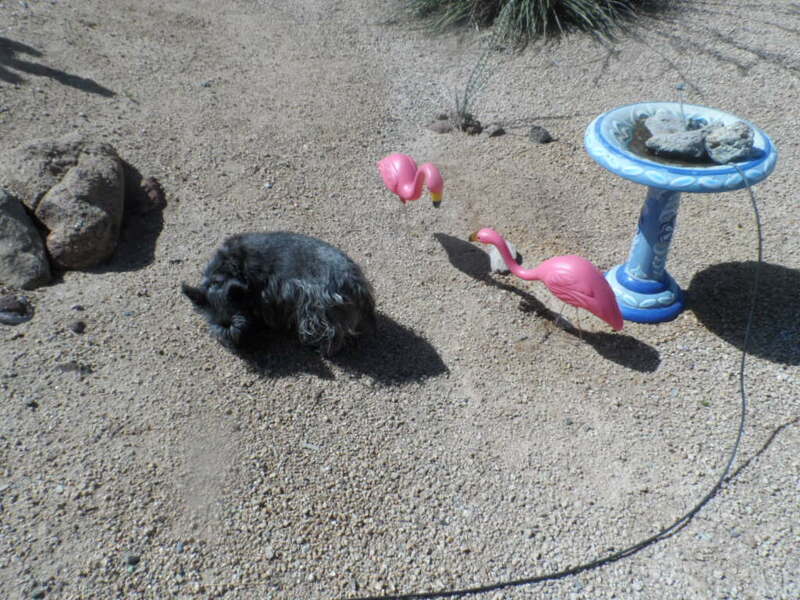 Flamingos always invite gnomes as house guests. Just letting you know. Good luck! You’ll have to give us an update on them after the summer is over. Kaci and Kali love to hunt gnomes but they haven’t found one yet and haven’t caught one. I’ll have to tell them that gnomes chase little pups. Yep it is mind blogging. Pink Phoenicopteris Ruber Plasticus, well I have Pink Flying Pigs all over my city. I have people dress in pink pig costumes. There were 36,131 runners in the Flying Pig Marathon today! The world has gone looney tunes for pink plastic. And none of the flying pigs thought about going airborne? Pink plastic for brains. Mr. Fox would LOVE to lift a leg on those! I mean they do look kinda fun, no?? Every desert needs a little color, right?? A little color? Mr. Fox has the right idea-turn them yellow. OMD! Well maybe they will move to the UK and you can put those flamingos in the garage……. And break out the kangaroos? LOL they’d go in the bin here or the naughty step for some one to take them away and give them a loving forever home. Have a marvellous Monday. I’d love to do that, but my powers only go so far here. welcome to the club, Kyla. We had just one of that shameingos, but it was a dress-up shameingo. Maybe you will have good luck and they steal it over night too? I cross my paws for the vet appointment, hope you will get good news. Steal them? Now I have to find a thief with bad taste. Just got back. Will report soon. Hey, tell the dogtor you’re just fine, K? I didn’t think you’d want this in YOUR yard either. No. I. Would. Not. If the peeps didn’t take such good care of you and yours, I’d say high tail it outta there. We’ve got a 5 foot pink flamingo that we proudly display. What are you trying to say about flamingo people, Kyla?